Here is the ultimate collection of black and white RWS tarot images in PDF format all for free. The RWS deck is so old that it is now in the public domain both under the old system and new system (life+70 years), so I am offering my collection for free. Each image is 1780x3180 pixels. The PDF files have bookmarks to make it easier to jump to a specific card. Navigate to a folder that you want the images saved to. I recommend creating a new folder for this. Then save. A file for each page of the PDF will be created in your chosen format, with the filename of the PDF and "_page_X" appended, with X being the page number for that image. Want a coloring book? It's pretty great for studying because you can meditate on the cards while coloring them in. You could buy Theresa Reed's coloring book. It's pretty great! It's flexibound so it can fold over on itself, and has great descriptions and coloring prompts for each card. Are 8.5"x11" pages too big for you? They're too big for me. I loved Reed's coloring book, but the size was too unwieldy. I've always said, "I'm a small person, I like small things." The start of this adventure for gathering these black and white RWS tarot images was so that I could make my own, smaller coloring book (and on better paper). But wait, there's more! Here are printer friendly versions! This next set of PDFs has two 5.5"x8.5" pages on one 8.5"x11" page, making it super easy to just print them on your home printer and cut them in half. Note that one side is upright and the other side is upside down, and it is ever so slightly off center towards the left. This is to optimize for printing on a home printer. Once you cut the page perfectly in half, the images will align darn close to perfectly. RWS Tarot Images on 2"x3.5" cards in black and white for FLASHCARDS! I'm not done yet! I've got some flash cards you can print out for yourself, too! I have cut off all the labels and positioned them to fit on 2"x3.5" cards. I have positioned 12 cards that can fit on a 8.5"x11" paper for you to print out and then cut out. This is not double sided. That would take a lot more effort on my part to line it up, and on your part to ensure your printer can handle it, too. So I didn't bother. Once you've cut out the flashcards, you can write whatever you want on the back. I've written the title of the card and brief reading notes. Measure the distance between the top and bottom of a card and mark a dot in pencil in the middle, then cut that row out along your mark. I use the metric side of my ruler to make this easily more accurate. You only need to do this once per page. Remember that the distance between two major arcana and court cards is different from the distance between the pip cards, because I cut the titles off. 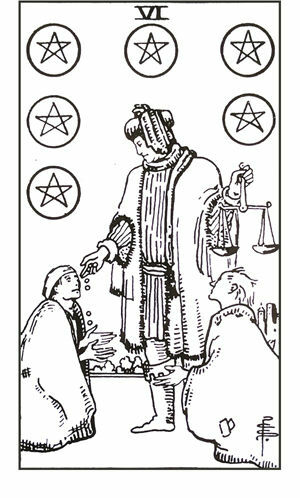 When measuring, be sure to measure only between pip cards and only between court and major arcana cards. Cut each row 3.5" high, using that first cut as your base for measuring. Cut each column out 2" wide. Remember that each image has a 1/8" border on either side. I recommend cutting out some blank cards, too, so you can write more information to quiz yourself about. Like, "Six of Earth" on one side, with the meaning on the other. Fixatif. Spray this before cutting so that none of the ink rubs off the paper. Now you should be able to work with the cards a lot more without ink rubbing off. If you plan on coloring in the flashcards, use a workable fixatif first to prevent the ink from smudging, then put the finishing spray on when done. Cardstock. Makes it more durable for frequent use. Transparent ruler grids. One of my most used items. I barely ever take out a regular ruler anymore. This will make it super easy to cut pages every so many inches from a straight edge. Also get the ruler grip to put on the back of the rulers so they move less. Paper trimmer. I use this all the time. It's great for long cuts, and if you get one of those ruler grids mentioned above, you can line it up on the board to make quick work of slicing up several batches. Replace the blade every few hundred pages or so. Retractable exacto knife. It's now second nature to me to retract the blade when putting it down and unretract the blade when picking it up. Safety first! And change those blades extremely often! Corner cutter. I like that particular corner cutter because it is a little larger. It fit perfectly in my hand making it easier for me as I was punching out 312 corners times two because I also made flashcards for my non-RWS deck. Phew! Well, after 624+ corner punches in a row, my hand was exhausted, but had made it through the work no worse for wear!